Note: the AQ6 boards come pre-flashed with test firmware only! It can’t be used for flying or calibration. It’s only meant for testing and debugging. The first thing to do is to flash a version of the AQ flight firmware onto the board. Note: AQ6.6 hardware sold before October 2012 requires ” revision 0” firmware. Newer boards are ” revision 1.” Details below. Please make sure that your ESCs/motors are not powered during firmware flashing. Although the firmware should prevent arming, you must take precautions to make sure that motors cannot run during firmware upload. 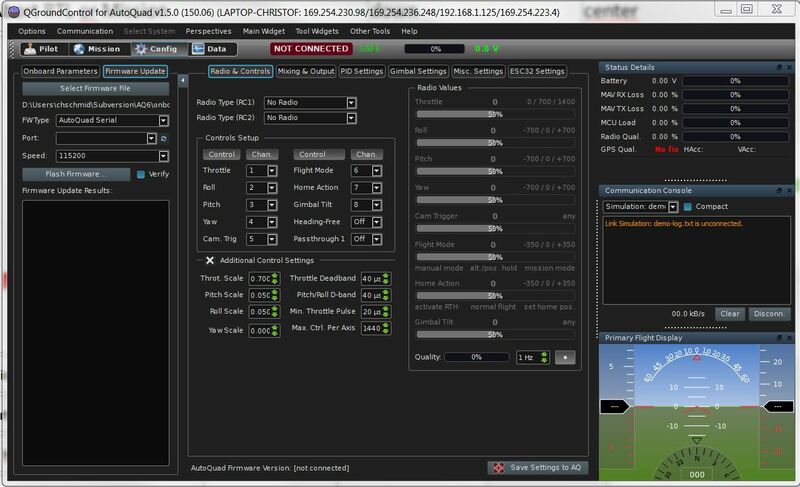 The easiest way to load the AutoQuad firmware is to download the AutoQuad Ground Control Station software for Windows/Linux, which contains a firmware upload utility. The compiled hex files can be found in the firmware download section, or you can compile your own. 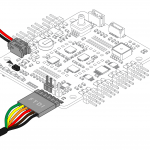 Besides the AutoQuad GCS, any stm32 flash utility can be used to upload the compiled hex file to the flight controller. If you are a developer and have an st-link device, you can use the SWD connector and upload using that path. 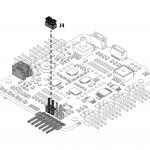 Hardware connections required for flashing firmware and the basic flashing steps involved. It’s important to ensure that your AutoQuad board is properly powered while you’re communicating with it. The 3.3/5V from the FTDI/USB interface is not used, so an external battery should be connected to the main power connector. Uploading firmware using AutoQuad GCS software. Flashing can only be done via a wired USB/FTDI connection, NOT via Bluetooth or XBee! Place a jumper on connector J4. That will put the AutoQuad into flash mode when it boots. Remove jumper J3 (if placed) so external FTDI power is not used. Connect a power supply (6.5-18V) to the battery connector. The flight controller should now boot up and only the red LED should be on. Connect the FTDI / USB serial interface. Start the AutoQuad GCS, select the ‘Config’ tab at the top, then the ‘Firmware Update’ tab. Click the ‘Select firmware’ button and select your .hex file from the file browser. Select ‘FW Type’ AutoQuad Serial. Check that the correct interface (COM port) is selected for your USB/Serial connection. The flashing routine cannot use the serial port if you were already connected to the AutoQuad using QGC/Mavlink. Please disconnect from the AutoQuad BEFORE clicking on ‘Flash Firmware’ . Failure to do so will cause a ‘device error’ message in the flash console screen. If you already clicked on the “Connect” button in QGC, disconnect it before you try to flash! Press ‘Flash firmware’ button and then on ‘OK’ in the warning prompt. The flash utility will now communicate with the STM32 MCU via the serial interface and upload the code. It will take around 1 minute to do so. The flashing progress will be visible in the debug screen under the ‘Flash Firmware’ button. 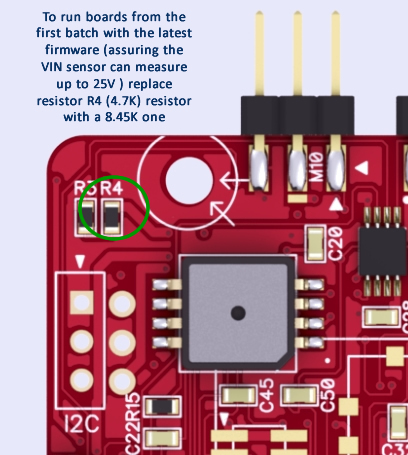 After a successful upload , remove the jumper on J4 and press the reset button next to the red led or recycle power of the board. The board should reboot ( blue GPS LED flashes once, green LED flashes continuously, red LED is on solid). MAVLink mode and upload your .param file and set your specific settings. Do NOT power on the AQ board. Only now reset AQ in BOOT mode (jumper on J4 and power on). Click “OK” in the confirmation window. The first public beta boards were delivered with a voltage divider that can display input voltages up to 15V, although the board allows up to 18V input. The combination of the resistors R3 & R4 is changed in the revision 2 boards from October 2012. Now the correct voltages above 15V are displayed. Using an r1 board requires the compiled hex files for revision 1 boards . 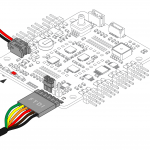 Conversely, using an older r0 board requires compiled firmware for that version board. Both versions are available on the firmware download page . Please note: as of firmware revision r109, hardware revision numbers have changed: rev0 (was rev1) is pre-October 2012, rev1 (was rev2) is October 2012 and later. To update revision 0 boards to display input voltages above 15V, the R4 resistor needs to be (carefully!) replaced with a 8.45K resistor of the same type, for example 311-8.45KHRCT-ND from DigiKey . A brief explanation of the process can be found in this forum post . If compiling firmware yourself, check the Development page for instructions about setting the hardware version. This page was created on 17-Oct-14 by MaxP. Last modified on 19-Oct-14 by MaxP.